The first thing to keep in mind when thinking about life expectancy is childhood mortality. Until the nineteenth century, childhood mortality in most parts of the world was around 50%, meaning half of all children who were born died before reaching adulthood. Many died in the first few days or weeks of life, but even those who hung on for the first few months were at high risk of dying in the following years. When you account for all those young deaths, the figure of an average lifespan in the thirties takes on a very different cast. Remember that it is an average. Lots of people dying young brings down the average, but those who survived the fist twenty years of life had a reasonably good chance of living to see fifty or sixty, and it would not have been that unusual to have a few people in any community who lived into their seventies or later. The extreme old ages recorded for legendary figures like Greek demigods or Biblical patriarchs are obvious fictions, but there are plausible accounts of people in their eighties and nineties hanging around in ancient and medieval times. Besides the particular risks of childbirth, life in the pre-industrial world was hard, labor-intensive, and dangerous for everybody. Without the scientific knowledge of germs, vaccines, and antibiotics, pre-modern people suffered from disease at much higher rates than we do today. Trial and error produced some effective treatments, but for many diseases you would be better off with no medical care than with what was available. Both organized warfare and personal violence touched the lives of many. Most of those who avoided violence and disease still had to face lifetimes of backbreaking physical labor, poor nutrition, and the mundane accidents that can happen to anyone anywhere. There was no shortage of ways to die in the ancient and medieval world. There were also things that reduced risk for some. Good nutrition was a very important one. Well-nourished bodies are much better at resisting disease and recovering from injury than poorly-nourished ones. Medical care could make a difference, for even though the treatments sometimes did more harm than good, it could also be helpful to have a wound properly cleaned and dressed or a boil lanced. A life free from arduous manual labor was more likely to be a long and healthy one. All of these advantages tended to favor the rich and powerful. The higher up on the social ladder you found yourself, the more likely you were to live a long time and have plenty of children survive you. Over time, the rich and powerful tended to out-breed the poor. While a few lucky individuals and family lines rose to or remained at the top, most branches of powerful families tended to fall into gradual decline. In cultures that practiced primogeniture, younger children had to make their way in the world and often ended up in worse circumstances than their parents. In cultures that did not, family fortunes got whittled down over time. Over many generations, families that had once been rich and powerful tended to slide down towards poverty, while poor families, lacking the advantages of wealth, tended to slide into extinction. We are all almost certainly the descendants of kings and queens, emperors and empresses, many generations down the line. Demography has a powerful effect on how people live and what a society looks like. In pre-modern societies, people had to live with the reality that half of their children would probably die young. Having many children was an adaptation to this fact, but so was a whole variety of behaviors that strike us as strange today. Customs like not giving a child a name until a few weeks or months after it was born or giving a very perfunctory and unceremonious burial to children who died young may seem heartless to us, but they make sense as a way of protecting yourself from the emotional toll that would come from losing half your children. The risks of childbirth also have cultural effects. When giving birth means a real risk to the mother’s life, decisions about family planning are inevitably shaped by that fact. The culture also has to cope with the reality of a lot of children growing up without their mother. 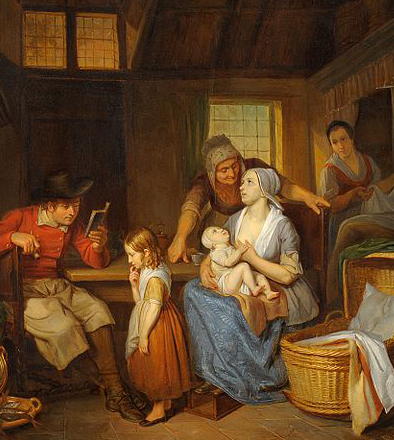 There may be good reasons why fairy tales are often filled with anxiety about step-mothers. In these conditions, people had to have a lot of children just to survive, so the age curve of the population skewed very young. Young populations have all the same problems of young people: they tend to be more violent, more reckless, and less willing to slow down and solve problems peacefully. On the other hand, they enjoy plenty of cheap labor and canon fodder. Moving into the present and potential future societies, we find very different patterns. Modern medicine and improved nutrition in the developed world means that very few people die young and most people can expect to live to increasingly older ages. The rapid rise in global population in the past two centuries has been largely a product of lower childhood mortality rates and longer lifespans; birthrates have in fact gone down dramatically throughout the industrialized world, and are trending downwards even in less industrialized regions. Japan and parts of Europe are now facing the problems of an aging population with too few young workers to take care of them. Other parts of the western world are already at less than replacement birthrates and are only sustaining sufficient levels of young workers through immigration. Older populations, like older people, tend to be less violent, more conservative, and more prepared to negotiate problems rather than fight, but they suffer from shortages of labor and fighting forces and have a high demand for health care. No matter where and when your stories may take place, the basic facts of demography have a powerful influence on how societies work and how people relate to one another.